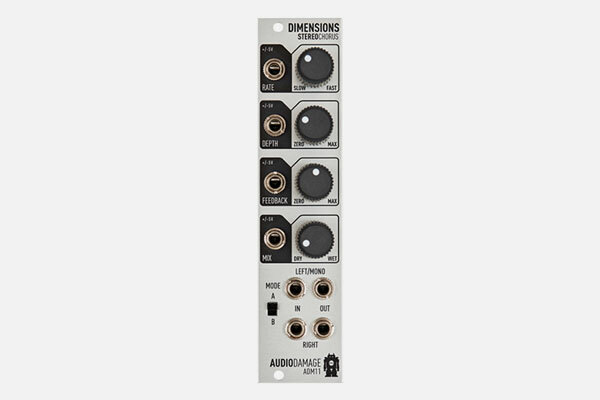 Dimensions is a true stereo chorus effect featuring two topologies. The first is a direct port of the AD-Fluid chorus plug-in, and the second is taken from the unit's namesake. With automatic routing based upon what you plug in the I/O, Dimensions can do mono->mono, mono->stereo, and true stereo chorus duties. Dimensions' Mode A operation is a ludicrously thick chorus. Most chorus effects have either a single delay line or a pair. Dimensions has six of them, each with its own modulation scheme. The Mode B operation changes the routing to match the vintage rack unit, but keeps the controls available. This results in a subtly different, but equally thick and appealing, effect.